5 of my favorite Valentine's Day desserts.....Including the the full recipes!! 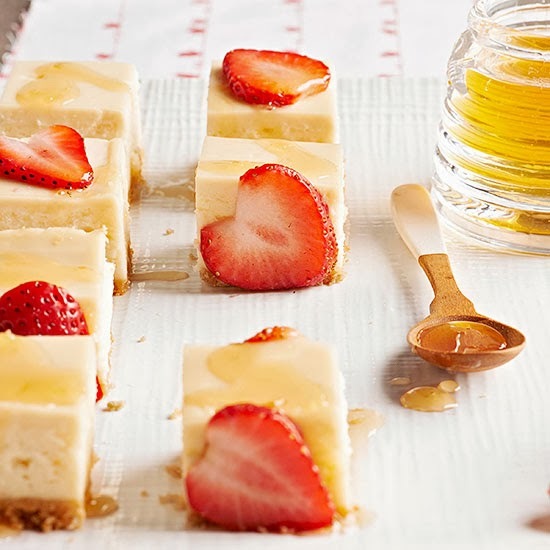 Every nibble of these sweet honey-topped morsels features crumbly shortbread crust and classic cheesecake filling. The sweetest part? The naturally heart-shape strawberry slices. Preheat oven to 325 degrees F. Line a 13x9x2-inch baking pan with heavy-duty foil or parchment paper, leaving 1 inch of foil hanging over edges of pan; set aside. For Shortbread Crust, in a medium bowl combine crushed cookies and 1 Tbsp. sugar. Stir in melted butter until combined. Press mixture into the bottom of prepared pan. For Filling, in a very large bowl beat the cream cheese and sugar with an electric mixer on medium to high speed until fluffy. Beat in flour until combined. Add eggs and vanilla; beat on low speed until just combined. Stir in sour cream. Pour filling in crust-lined pan. Bake for 40 minutes. For Sour Cream Honey Topper, in a medium bowl stir together sour cream, honey, and vanilla. Remove cheesecake from oven. Spread mixture over hot cheesecake. Bake for 10 minutes more. Cool in pan on a wire rack for 1 hour. Cover; chill at least 4 hours. Use foil to lift uncut bars from pan. Cut into 54 bites. Top each square with a strawberry slice. If desired, drizzle with additional honey. The romance of chocolate-covered strawberries takes a delightfully elegant turn in this luscious Valentine's Day dessert recipe. 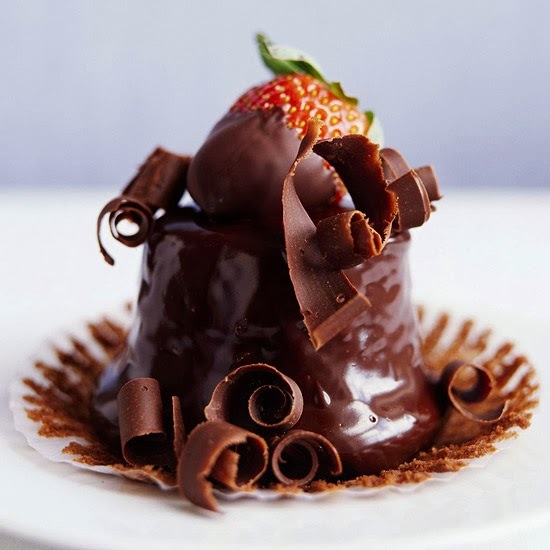 Upside-down cupcakes are smothered in rich ganache and topped with fresh strawberries. Preheat oven to 350 degrees F. Grease and flour or line with paper bake cups twelve 2-1/2-inch muffin cups; set aside. In a large saucepan, melt butter over medium heat. Remove from heat. Let cool for 5 minutes. Stir in sugar and cocoa powder until combined. Add egg and vanilla. Using a wooden spoon, beat lightly just until combined. In a small bowl, stir together flour, baking powder, baking soda, and salt. Alternately add flour mixture and milk to chocolate mixture, beating by hand after each addition. Spoon batter into prepared muffin cups, filling each two-thirds full. Bake for 15 to 20 minutes or until a toothpick inserted near the centers comes out clean. Cool in muffin cups on a wire rack for 10 minutes. Using a knife, loosen the edges; carefully remove cupcakes. Cool completely on a wire rack. If cupcakes don't have paper liners, trim a thin slice from top of each cupcake so they will sit flat. Turn bottom side up. Place cupcakes 2 inches apart on wire rack set over waxed paper. (For cupcakes in liners, peel liners down but do not remove.) Spread 1 teaspoon of the strawberry jam over each cupcake. Prepare Bittersweet Chocolate Ganache. (below) Spoon ganache over cupcakes, making sure to coat all sides. Place a strawberry on top of each cake. Drizzle each strawberry lightly with ganache, letting the strawberry show through. Top cupcakes with chocolate curls. In a medium saucepan, bring the whipping cream just to boiling over medium-high heat. Remove from heat. Add the bittersweet chocolate, chopped (do not stir). Let stand for 5 minutes. Stir until smooth. Whisk in the butter, 1 tablespoon at a time, whisking until ganache is smooth. Take a love of doughnuts to the next level. 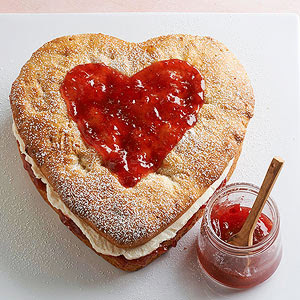 Layers of luscious cream filling and ruby red jam between soft yellow cake mimic your sweetheart's favorite breakfast treat. In a medium bowl stir together 2 cups of the flour and the yeast; set aside. In a medium saucepan heat and stir milk, granulated sugar, butter, and salt just until warm (120 degrees F to 130 degrees F). Add milk mixture to flour mixture. Add eggs and vanilla. Beat with an electric mixer on low speed for 30 seconds, scraping the sides of the bowl constantly. Beat on high speed for 3 minutes. Using a wooden spoon, stir in remaining flour (dough will be very soft and sticky). Cover surface of dough with plastic wrap; chill for 2 to 24 hours. Generously butter a 9x2-inch deep heart-shaped or round cake pan. Using a buttered spatula, transfer dough to prepared pan and smooth to an even layer. Cover; let rise1 hour or until double in size. Preheat oven to 325 degrees F. Bake for 30 to 35 minutes or until golden brown. Cool in pan on wire rack for 5 minutes. Remove cake from pan; turn top-side up. Cool completely on wire rack. Using a long serrated knife, split cake in half horizontally; remove top. Place bottom layer, cut-side up, on a serving plate. Spread with jelly. Spoon Cream Filling over jelly; spread to edges. Place top layer of cake on filling, cut-side down. Dust cake with powdered sugar; decorate with jelly. In a small saucepan whisk together the milk and flour until no lumps remain. Cook and stir over medium heat until thickened and bubbly. Cook and stir 1 minute more (mixture will be thick). Stir in vanilla. Transfer to a small bowl; cover surface with plastic wrap and cool to room temperature. In a medium mixing bowl beat butter and shortening with an electric mixer on medium to high speed for 30 seconds. Add the sugar and salt and beat for 1 to 2 minutes or until well-combined. Add the cooled milk mixture and beat until smooth. Red is the color of Valentine's Day, but the taste of this luscious dessert recipe is all chocolate. 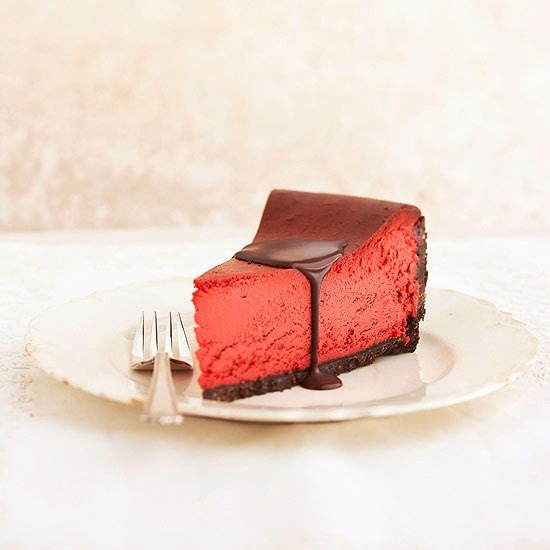 This elegant cheesecake marries red velvet flavor with a creamy twist. In a medium saucepan, melt chocolate and 1/2 cup butter over low heat; transfer to a bowl and cool completely. Place wafer cookies, chocolate pieces, almonds and brown sugar in a large food processor. Cover and process until finely ground. Add the 1/2 cup melted butter; cover and process until well combined. Transfer crumbs to a 10x3-inch springform pan with a removable bottom. Press crumbs onto bottom and up the sides of the pan, leaving a 1/2-inch space at the top of the pan. Set aside. In a very large mixing bowl, beat the cooled chocolate mixture, cream cheese, sour cream, sugar, buttermilk and red food coloring with an electric mixer on medium to high speed until combined. Add 4 eggs and 2 egg yolks all at once. Beat on low speed just until combined. Pour filling into crumb-crust lined springform pan. Place springform pan in a shallow baking pan on the oven rack. Bake in a 350 degree F oven about 1 hour, or until 2 inches of outside edge appear set when shaken gently. Remove springform pan from baking pan. Cool cheesecake in pan on a wire rack for 15 minutes. Use a small metal spatula to loosen cheesecake from sides of pan. Cool 30 minutes more. Remove sides of pan. Cool for 1 hour; cover and chill at least 4 hours. 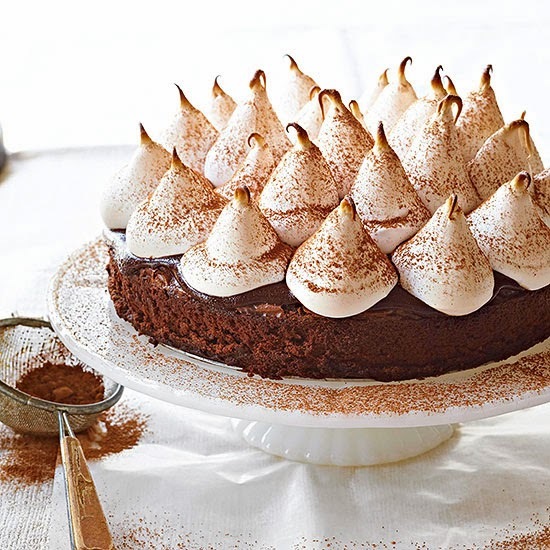 To serve, use a paper doily to decoratively sift powdered sugar and cocoa powder on the top, if you like. Garnish the center with chocolate leaves and fresh raspberries, if you like. Clean knife between each cut. Makes 20 servings. This stunning Valentine's Day dessert starts with a brownie mix. Rich chocolate glaze is the first upgrade, followed by puffs of marshmallow-coffee frosting. Preheat oven to 350 degrees F. Grease the bottom of a 9x1 1/2-inch round cake pan. Line bottom of pan with parchment paper. Grease parchment; set aside. Prepare brownie mix according to package directions. Pour into prepared pan. Bake according to the package directions for a 9x9-inch square pan or until a wooden toothpick inserted near the center comes out clean. Cool completely on wire rack. Remove brownie from pan. Place cooled brownie on a baking sheet. In a small saucepan, bring cream just to boiling over medium-high heat. Remove from heat. Add chocolate (do not stir). Let stand for 5 minutes. Stir until smooth. Chill for about 5 minutes or until it reaches a spreading consistency. Spread chocolate over top of brownies in an even layer. Chill for 30 minutes. Meanwhile, prepare Marshmallow Coffee Frosting. Pipe or spread Marshmallow Coffee Frosting onto top of cake. Chill for 15 minutes. Preheat oven to 450 degrees F. Bake about 5 minutes or until lightly browned. Cool completely on a wire rack. If desired, dust with cocoa powder. In the top of a 2-quart double boiler combine sugar, the cold water, egg whites, and cream of tartar. Beat with an electric mixer on low speed for 30 seconds. Place the double boiler top over boiling water (upper pan should not touch water). Cook, beating constantly with the mixer on high speed, for 10 to 13 minutes or until an instant-read thermometer registers 160 degrees F when inserted in mixture. Remove pan from heat. Add liqueur and vanilla. Beat about 1 minute or until frosting is fluffy and holds soft peaks (tips curl).